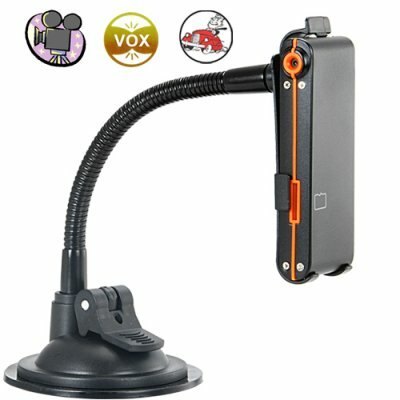 Successfully Added Mini Video Recorder with In-Car Mounting Stand to your Shopping Cart. Convenient new digital video recording camera with a flexible mounting stand for use in cars or on desktops. With video capture in computer friendly AVI at 30 frames per second and an included 4GB microSD card, you are ready to make high quality video files as soon as you take this DV camera out of the box! Incredibly convenient mini digital camcorder, this video camera is designed to be mounted on a car dashboard or windshield and enables you to capture video of road situations. Start up your car, hit the one- click record button, and off you go, a whole day of road events being recorded as they happen. An extremely useful camera for insurance, security or even law enforcement purposes. Can even be used for fun if you are a weekend indy car racer who wants to record the first-person action for later review. The CVFR-DV21 Mini-Video Recorder really should be called the "Worlds Best In-Car Video Recorder". Why? Because it does a lot more than your normal car video recording device. This model records AVI video files at 30FPS (640x480) and is designed to be easily snapped into and out of its mounting stand so it can be taken with you when you leave your car. That is a great feature to make it available as an in-field video recorder if you need to get out of your car and view an incident more closely. If being a great video camera for cars wasn't enough, the CVFR- DV21 Mini-Video Recorder also makes a convenient desktop camcorder. Whether you want to record interviews and meetings for archival purposes or want to take it out of its stand and use it as a hidden "cam", this one digital video camera will cover all your needs. Having a great assortment of convenient features, this mini video recorder will meet all your needs as an in-car video camera and even more. The CVFR-DV21 Mini-Video Recorder with In-Car Mounting Stand makes all day video recording easy, and with a low factory direct wholesale price there is no excuse not to get one right now! It is available in our warehouse for single piece or bulk orders, so order yours today and we will ship it out tomorrow! Guaranteed!! Includes a bonus 4GB microSD card - FREE! Overwrite function enabled such that video footage is recorded to memory until full. At that point, if the only contents of memory is previously created video footage from this product, recording will continue over existing files. If memory contains other files of any type whatsoever, video recording will stop. 4GB microSD card - FREE Bonus Gift! Who needs a video recording camera for their car? Any security guard, private investigator or journalist should have this kind of camera to capture incident details you may not have time to write down such as license plate numbers, witness faces, exact incident locations, etc. "Regular People" who drive in busy urban areas where traffic incidents often occur are also good candidates for this kind of personal protection device. What is the difference between this particular model (CVFR-DV21) and others I have seen on the market? This model is designed to be easily snapped out of its mounting stand and taken with you when you leave your car. That is a great feature to ensure the camera from theft, as well as making it available as an in-field video recorder if you need to get out of your car and view an incident more closely. My computer does not recognize the camera, what should I do? The camera needs to be turned ON before your computer will recognize it. When you attach it to your computer it will be recognized as a USB mass storage device, just like any other standard DV camera. You can also keep it plugged in and turn it OFF/ON to help it in being recognized by the computer. How do I update the time on the videos produced by this camcorder?